Niche line Bond no. 9 will launch Sutton Place, a new "classically masculine" fragrance. Here at Bond No. 9, we have a history of firsts. Ours is the first-ever city-oriented parfumerie, scenting the neighborhoods of our beloved home base, New York. We’ve done the first fragrance honoring conflict resolution and tolerance—our bestselling Scent of Peace; the first financial scent—Wall Street; and even the first shopping scent—Madison Avenue. And now, arriving on counter October 1, we are exceedingly proud to introduce the world’s first and only first diplomatic eau de parfum—which of course could only emanate from New York, home to the United Nations headquarters. [...] As befits the assured and authoritative traditional role of men in global diplomacy, we’ve given Sutton Place, the scent, a distinctly masculine profile. This is an impactful gourmand floral oriental whose topnotes are a tangy-spicy cocktail: citrusy bergamot and tangerine combined with piquant pink pepper, fresh but intense cassis, and juicy, tropical, flavorful pineapple. At Sutton Place’s heart is an assertive floral bouquet: seductive jasmine, intoxicating lily, and heady patchouli. What gives this scent its ultimate bona fides are its strong, classically male basenotes: warm and resolute amber along with animalic musk and leather, leavened by a softening shot of vanilla. Bond no. 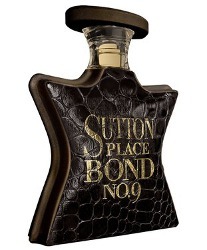 9 Sutton Place will be available in 100 ml Eau de Parfum, $350 . ???? Hah! I’ll have to get a sample for my husband since that’s our neighborhood. I’ll tell him it’ll make him a powerful global gentleman…. As long as it means he’ll still handle the litter box…. I was very surprised to see this. Would think they could have done a men’s fragrance without focusing on any particular activity which was traditionally reserved to men.